I like bulgur pilafs as light summer lunches , because they are easy and quick to make, and if cooked with olive oil, can be eaten cold or warm. 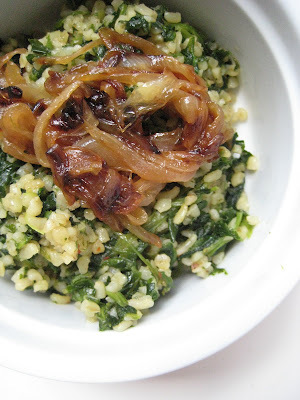 Bulgur Pilaf with Spinach and Fried Onions recipe is introduced as a rural Arab recipe by Paula Wolfert in The Cooking of the Eastern Mediterranean. I decided to try it, because it reminded me of a Turkish pilaf recipe with white rice and spinach. It is a really tasty, refreshing recipe with a nice twist of fried onions. It goes well with red meat and/or yogurt. -Heat 2 tbsp of olive oil in a skillet and cook the onions on high-medium covered, stirring frequently, until they are golden brown. -While onions are cooking, heat 1 tbsp olive oil in a pot and add spinach to wilt approximately 5-7 minutes depending whether it's fresh or frozen. 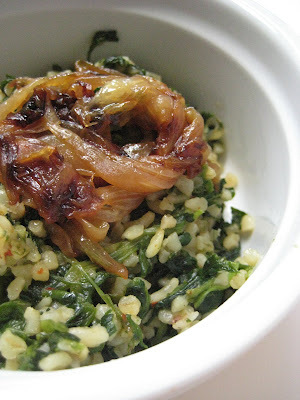 -Once spinach is wilted, stir in bulgur, stock, salt, and spices. Cover and cook over low until it soaks all the stock or bulgur is tender. -Remove bulgur from heat and let stand, covered, for 5 minutes. -Stir in the fried onions. This recipe is for a bulgur recipes event held over at Deryadan Lezzetler. This sounds so delicious! I like the new look for your blog and love seeing a photo of you! Very nice: I am going to make this soon. Like Kalyn, I like the new look of your blog. I just posted a bulgur recipe too, Burcu! Yours sounds delicious with fried onions. They make everything taste better. Beautiful photo in your new blog banner! I love recipes with bulgur -- and I love the pairing of spinach with allspice, so I'd definitely include that -- with some red pepper flakes, too. lydia-tell me how it tastes with allspice; maybe i'll try it next time. val-I found the book at the library and liked it a lot; instructions are very clear and recipes are great. Yum! Just tried this with a couple of alterations. Used half fresh spinach and half arugula (thought I had some more spinach in the freezer, but I didn't). Used a LOT of paprika (some of it the hot paprika) instead of the pepper flakes. And added a tablespoon or two of tomato paste. Wonderful!!! I'm really enjoying this blog! 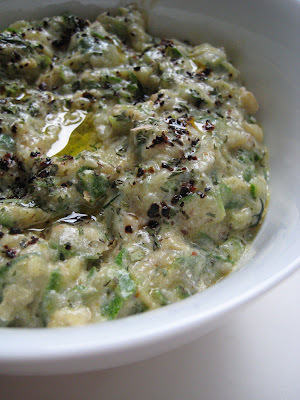 I'm not a spinach lover but this recipe/dish is the only reason I buy spinach these days :). Thank you for this recipe ...my family liked it too.